She said those were their rules for a successful day. Every day do something that’s maybe hard to do but good for you. Tackle a chore you’ve been putting off, the one that you’ve spent more psychic time and energy on than the actual task would take! Send a note just to say “hi”. Wow. Consider writing it on paper and sending it by real mail. Pay a compliment. You know I’m a big fan of this one! Dance. Better yet dance naked. Oh, go on… dance naked in front of a mirror. I do this one every day. Some parts of me keep dancing long after I’ve stopped moving! The beautiful thing about these every day rules of success is that each one will make you feel better. The hard stuff, even just attempted, will boost your sense of accomplishment. You cannot do for others without putting a gloss on yourself. And doing something just because it’s fun reminds you that you are lovable and life is a joy. 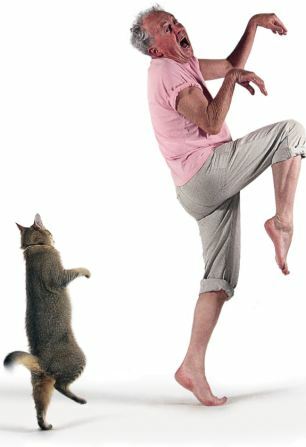 If you manage to dance naked in front of your pets while flossing your neighbour’s teeth you will be positively sublime. My mother liked to tell the story of the day she kicked me out of the house. I was two years old. I remember none of what I’m about to tell you. I was one of those kids who resisted toilet training. I squawked to be changed if I had a wet diaper. But sitting around in my own poo? Fabulous! I didn’t mind the warm, squishy, cushiony comfort. Maybe I even liked it. I can’t say. My mother knew I knew how to use the toilet. She knew I knew the whole wearing-diapers business was no longer acceptable. She also knew I just didn’t care. Nope, not one bit. No amount of reasoning, cajoling, encouraging or coercion could make me do what she wanted me to do. In desperation she took a calculated risk. So I took that suitcase and I left. I walked all the way to the end of the street. And then I stood there. The street ended at a very busy road. My mother watched from the porch, her heart hiccupping and beating double time. She said it seemed like forever as I, just a tot, stood there, clutching the suitcase, puzzling over how to navigate the traffic. I never wore a diaper again. Pick your battles. This was one battle my mother really did have to win, and I’m glad she did. Fortune favours the brave. If I had just crossed that road, who knows where I’d be now? But seriously, my mother took a big risk and got her results. Update: since writing this post, my sister who is seven years older than me, confirmed that the contents of the suitcase were a pair of socks, a pair of terry cloth underwear and a book. I guess my mother expected me to come back. In her last two years, my mother was plagued with increasing poor health and dementia. Her move from living in her own house to a quasi-nursing home was swift and dramatic. I bundled her home with me on Christmas Day so I could help her get over a flu bug and by New Year’s Eve she was sipping “champagne” at Victoria Place retirement home. We whittled her many possessions down to what was most precious to her. We filled her one new room with books, photo albums, vases, some paintings, a chair and a large cabinet. I also stashed many of her endless crafting supplies in the nursing home’s rec room, but my mother never touched them again. Everything else, including her house and car, was given to family members or charity or sold. A month before my mother died, I had a birthday party for her and invited all her friends. 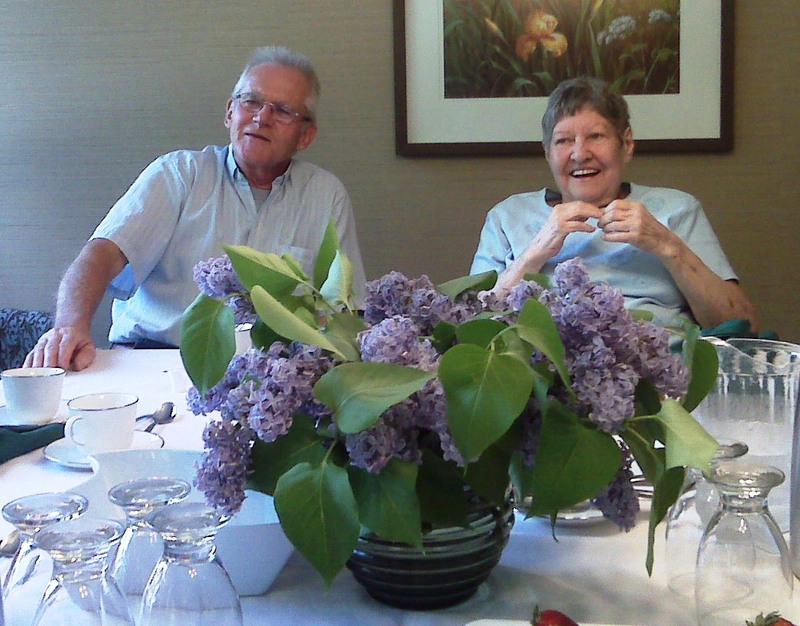 I brought her mother’s vase to the nursing home and filled it with lilacs. My mother could no longer recognize some of the people at the party, but she exclaimed over the vase and was lost in memories of her mother, of lilacs, of birthdays past, of the vase and of bringing it to Canada. In her last week, my mother was taken by ambulance to the hospital. The only possession she ever expressed any concern for was her false teeth. Where were they? Could she have them in? Eventually she slipped into a coma and her teeth were taken out. It was just my mom then – naked under a sheet in a mercilessly sunny hospital room with her family and her dearest friend at her side. That’s what your life comes down to. You. Your experiences. And the people you love.